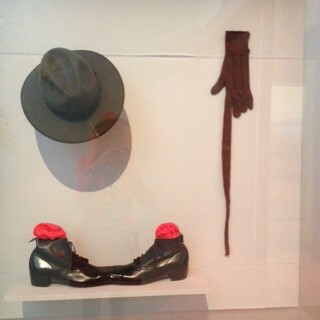 Joined together shoes, one long fingered glove, and a hat with a zip, all are absurdly silly pieces made by Barry Humphries, in the fifties whilst a dadaist studying at Melbourne University. These and other pieces by working Australian artists are featured in the “Lurid Beauty Exhibition” currently showing at the NGV’s Ian Potter Centre, Federation Square. 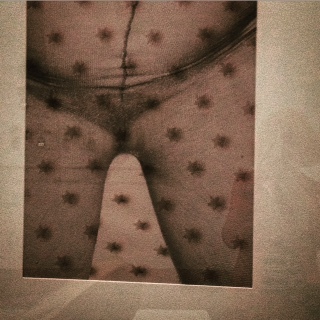 Many of my favourite Australian artists are showing including Pat Brassington, a Tasmanian photographer and printmaker whose work features disembodied parts of the female body. Exhibitors include Rosslynd Piggot, whose massive white bed imposes an improbable and powerful presence above the space inviting all to dream. 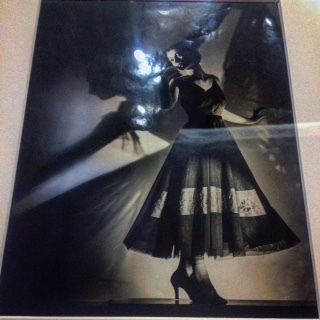 The gorgeous black and white photography of Max Dupain of the 1950’s models portrays images of a graceful and bygone era. Early collage work by Sidney Nolan and David Noonan are featured. A taxidermied black cat waves goodbye to us at the end of the show. 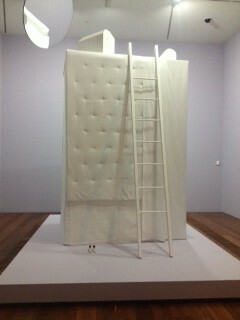 It looks like a stage prop or TV show persona and not a gallery piece. Such is the depth and wonder of this show my eyes were opened to works by artists I knew but didn’t know were part of the Dada and Surrealism movements. Being removed from Europe and the USA these artists created their own version of the movement. It is a brilliant show and many of these influential artists are currently teaching and working in Australia. 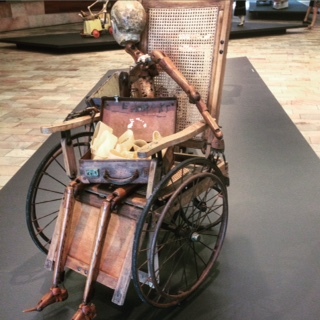 I found particularly poignant and whimsical the installations by Judith Wright in the foyer. They are assemblages of found objects of childhood relics eg horses heads, child’s toys and a rowboat. These works depict the loss of her child, and are the artists imaginings of how her child’s life would be if she had lived and grown through childhood. This exhibition educated and exposed me to a vast area of work by Australian artists working in a wildly inventive field of exploration. I volunteer at a local Op Shop. One of my duties is to window dress the children’s window with exemplary donated goods. Amongst yesterday’s donations I found a pack of large playing cards based on the child’s Dr Seuss story, ‘One Fish Two Red Fish Blue Fish’. It was a much loved story in my household when all four of my children read it and re read it, passing it eagerly and reverently from sibling to younger sibling. Throughout the course of the day , my ideal customer had materialised to purchase the strategically placed item . A young boy of 6, dressed in school uniform was passing the shop, with his dad, obviously on his way home from school. He had spotted the cards and implored his dad to stop and let him buy them. His eager face radiated joy as he entered the shop, went straight to the window and tentatively plucked the brightly coloured treasure from its resting place. At the counter, he nervously proffered the exorbitant sum of $3 to the startled elderly volunteer. Quickly exiting the shop he crouched in the expansive doorway, with his patient parent. He fastidiously removed the cards from the packet, laboriously counting each to make sure he had the full set and to marvel at their wondrous beauty . His bemused dad looked on. I observed, from the shelter of the women’s designer rack, and knew I had done well. I had not only bestowed an item of great worth into the right hands, but had also possibly instilled a lifelong passion of recycling, into one so young. Now if only I could find a home for the vintage Enid Blyton book, lovingly inscribed on the flyleaf in timeless copperplate handwriting ” to Alice , Happy Christmas 1929 , love Pam ” !